An appeal for path strimming was sent out to the 10 Association trained trimmer operators at the beginning of June 2018 and 4 answered the call for help over the period from 5th June to 10th July 2018. A big thank you goes to Don Kamsley who strimmed the whole of the circular Squirrel Trail, the car park, Red Squirrel Hide area and Contemplation Shelter area in 5 hours on 5th June; to Anna Wynne who strimmed the lower path from Jan’s Hideaway to the junction at Clach Bhadach in 1.5 hrs on 6th June; to Leonard Gow who strimmed from the top junction above Jan’s Hideaway to the north west corner of the 2.5 km circular path in 3 hrs on 26th June; to Frances Walker who strimmed the path from the top north west corner of the 2.5 km circular path, including the top bench area down to almost the bottom of the path towards Clach Bhadach in 4.5 hrs on 26th June; to Leonard Gow again for finishing the path where Frances finished to the Clach Bhadach junction and north to the Rhododendron tunnel in 1.5 hrs on 10th July and to Douglas Locke who pruned all the trees around all the paths and the Rhododendron tunnel in 11 hrs on 5th & 26th June and 10th July, also supporting the strimmer volunteers as their First Aider. Over this last month the paths have grown again and will need re-strimming by the end of July so we hope that the other trained trimmer operators will volunteer their services as the above ones have done over the last few weeks. The Cormonachan Community Woodlands rely on the trained members to do this strimming to keep the paths in good order. If the paths are strimmed before they get overgrown, it takes less time to do them. Frances Walker’s section above was well overgrown and it probably took her twice the time to do than it would have done if done regularly. The average time to complete the strimming of all the paths is about 12 hours and they need to be done a minimum of 3 times annually that comes to 36 hours each year. 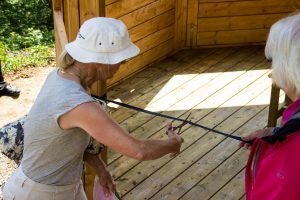 If each of the 10 trained volunteers contributed to the strimming, each would need to offer only 3.6 hours of strimming volunteering per annum. Other members can help by scything as you don’t have to have a certificate to scythe as you do for using a trimmer. Training for use of a scythe can be offer by the Association if anyone is interested in helping out. The Cormonachan Woodlands Association are extremely gratefully to the volunteers who have so far been keeping the paths strimmed and in good order for walking on. 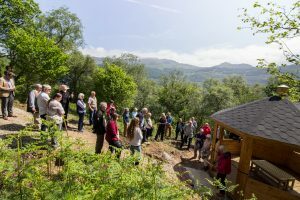 On Wednesday 6th June 2018 just after 11 am, the Red Squirrel Hide in Cormonachan Woodlands was officially opened. Douglas Locke gave a speech about how the funding was raised and David Thorpe, CEO of Ardroy Outdoor Education Centre cut the ribbon a gave a short speech. Whilst the weather was perfect, around the shelter area there were a few too many midges with no wind so everyone moved on to the Contemplation Shelter. 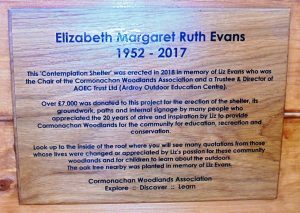 Again, on Wednesday 6th June 2018 at 11.30 am 31 people gathered after a short walk to the entrance of the Contemplation Shelter in memory of Liz Evans in Cormonachan Woodlands. Douglas Locke gave a speech about Liz’s final request to ask her friends and family to donate towards a shelter instead of giving flowers at her funeral. 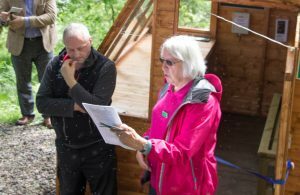 As you will by now know over £7,000 was donated and in just 4 months planning permission was obtained, the shelter ordered, groundwork with concrete base and path prepared and then the shelter was erected on 21st May. Liz’s kayaking friend, Christobel Fallon was asked to cut the ribbon and give a short speech about her friend. 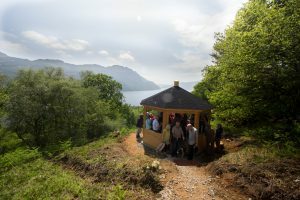 The weather for the event was perfect – dry, sunny and very warm with a slight wind that let everyone enjoy the visit to the shelter midge free so there was no rush to leave but to contemplate on the words that had been written about Liz and to enjoy the wonderful view over Loch Goil from the shelter that was Liz’s favourite view. 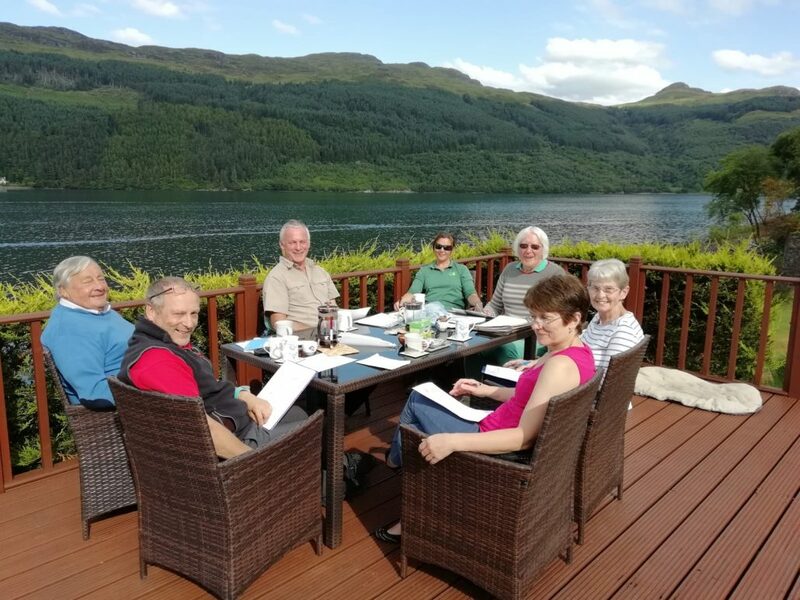 This was followed by 22 pre-invited guests going to a reception at The Lodge on Loch Goil where an excellent light meal was served at 1 pm sponsored by our corporate members at The Lodge. 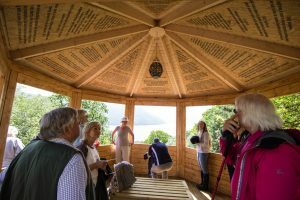 Alongside the Contemplation Shelter an oak tree in memory of Liz had been previously planted by Douglas, Liz’s husband and Calum, her son and her ashes had been scattered around the tree with a plaque erected in her memory. The day could not have been better and was enjoyed by all. 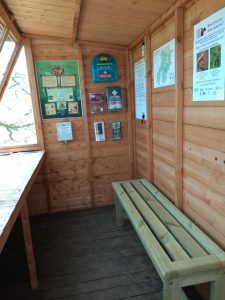 Both the Red Squirrel Hide and the Contemplation Shelter are now open all year round 24/7 to members and visitors. Although the Red Squirrel Hide and shed were erected on 12th March 2018, the volunteers only managed to get the second coat of preservative paint on the hide and shed on 6th May 2018. The Red Squirrel Hide is open all year round to members and visitors in the Cormonachan community woodlands. 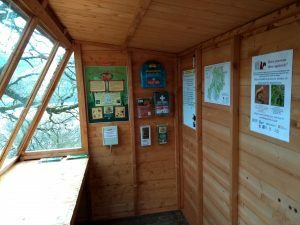 Please record the time of sightings on the white board in the hide as it helps others to know when the red squirrels are around. Be prepared to spend 10 minutes in the hide as often when the red squirrels see no one around they go to the feeders and you can watch them. 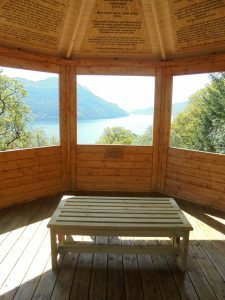 The Official Opening of the Red Squirrel Hide and the Contemplation Shelter (being erected on Monday 21st May 2018) will be on Wednesday 6th June 2018 at 11 am meeting in the car park. Those coming will walk anti-clockwise around the Squirrel Trail to the Red Squirrel Hide first and then to the Contemplation Shelter up the hill. There will be short speeches and ribbon cutting before returning to the car park. The event will last about one hour. The Walking Theatre Group is coming to Cormonachan Woodlands! Cormonachan Woodlands Association and Argyll Arts Collective are bringing together two performances by The Walking Theatre Group on Sunday 15th April 2018 in Cormonachan Woodlands by Carrick Castle. This performance will last up to 1 hour 20 minutes. £6 each or £20.00 for family ticket of 4. This performance will last 1 hour 30 minutes. 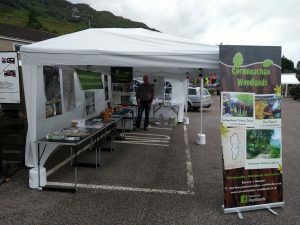 Minibus transport from Lochgoilhead car park will be available to & from Cormonachan Woodlands car park. The Walking Theatre Company create and adapt their family fun shows to suit outdoor locations. Their performances involve a promenade around the performance location, guided through by the performers themselves. They perform a range of different shows some for all the family to watch and sometimes interact with, to adaptations of classic Shakespeare to more contemporary writing. Please note that the paths in Cormonachan Woodlands are rated as easy to moderate (moderate being up the short paths from bottom to the top path). Please “Leave No Trace”. For further information and booking – contact Joni at argyllartscollective@gmail.com or at 07765 016543.
http://www.cormonachan-woodlands.co.uk/admin/wp-content/uploads/2018/01/logo2-300x68.png 0 0 Douglas Locke http://www.cormonachan-woodlands.co.uk/admin/wp-content/uploads/2018/01/logo2-300x68.png Douglas Locke2018-04-04 22:35:332018-04-04 22:35:43The Walking Theatre Group is coming to Cormonachan Woodlands! Report on the Volunteers Weekend of 24th & 25th February 2018 in Cormonachan Woodlands. Saturday 24th February – We had 11 volunteers from Fife, 3 volunteers from the Loch Lomond & Trossachs National Park and only 4 CWA members of which 3 were committee members. The Fife volunteers of which one came up from Cumbria felled 6 of the very large under planted Sitka spruce trees in Area 1 and burnt all the brash under the CWA’s felling licence all day and a rotten oak that could have posed a danger to one of the paths in the future. The NP volunteers with one of our committee members cut down Rhododendron in area 3a by the lower path in the morning whilst the other three CWA volunteers erected 10 new signs around the woodlands on posts. In the afternoon, 2 CWA members continued cutting down Rhododendron with the 3 NP volunteers. 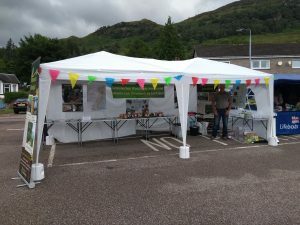 This was a very successful day in achieving such a lot for the community woodlands. Sunday 25th February – The 11 Fife volunteers continued to fell another 5 large Sitka spruce and burnt all the brash all day. This now leaves just 2 pockets of 5 Sitka spruce trees in each in Area 1 to fell under the CWA licence with Forest Enterprise Scotland and the Fife volunteers hope to complete this in the autumn. Only two CWA committee members volunteered in the morning and they prepared the site for the Red Squirrel Hide and shed digging ditches to keep the site area as free from water as would be possible. In the afternoon only one committee member remained (aged 76) to carry on working and he pruned branches along side some of the paths, painted a new post for a new squirrel feeder and cleaned out & drilled out 2 bases, re-sited one of the feeders that the squirrels seemed not to be feeding from and put away all the tools used. We have to say it was extremely disappointing that there was such a lack of support from CWA members to volunteer in our community woodlands especially when the weather was absolutely perfect all weekend. We do hope that at future volunteers days more members will come and help. 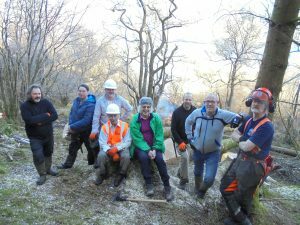 All the Fife and NP volunteers commented to us how they enjoy working in Cormonachan Woodlands so hopefully local people will come and enjoy the experience and make a difference to the woodlands that has to be maintained. http://www.cormonachan-woodlands.co.uk/admin/wp-content/uploads/2018/01/logo2-300x68.png 0 0 Douglas Locke http://www.cormonachan-woodlands.co.uk/admin/wp-content/uploads/2018/01/logo2-300x68.png Douglas Locke2018-02-26 12:17:362018-02-26 12:21:31Report on the Volunteers Weekend of 24th & 25th February 2018 in Cormonachan Woodlands. 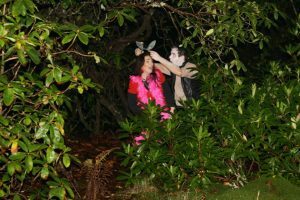 The Walking Theatre Company is coming to Cormonachan Woodlands! 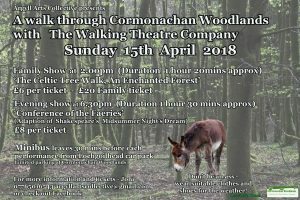 Cormonachan Woodlands Association and Argyll Arts Collective are bringing together two performances by The Walking Theatre Company on Sunday 15th April 2018 in Cormonachan Woodlands by Carrick Castle. http://www.cormonachan-woodlands.co.uk/admin/wp-content/uploads/2018/01/logo2-300x68.png 0 0 Douglas Locke http://www.cormonachan-woodlands.co.uk/admin/wp-content/uploads/2018/01/logo2-300x68.png Douglas Locke2018-02-17 10:23:572018-03-18 11:44:12The Walking Theatre Company is coming to Cormonachan Woodlands! This weekend our Fife Volunteers are back again to continue felling the remaining 19 under planted Sitka spruce trees in our felling licence of 44 trees in Area 1 between the Squirrel Trail paths. Our own member volunteers will have various maintenance tasks to do, including strimming the paths where needed, cutting down the invasive Rhododendron ponticum and pruning overhanging branches from above the paths, painting the newly erected Red Squirrel Hide and storage shed, erecting 10 new information signs plus other jobs that may be needed to be done over the weekend. Come and join us for a morning, afternoon, a day or on both days. 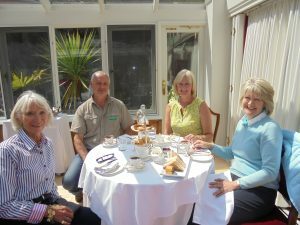 Meet at Jan’s Hideaway please – your assistance will be more than welcome! On Saturday 20th January 2018, Liz’s funeral was held at Cardross Crematorium where over one hundred friends and family attended despite the snow and icy weather conditions. 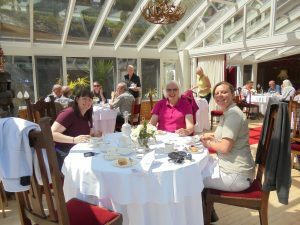 This was a Humanist Celebration of Liz’s Life where everyone wore colourful dress and listened to some of Liz’s favourite music and her sister, Gwyneth, Phil from Ardroy, her son Calum and husband Douglas gave speeches covering her very full 65 years of her life where she achieved and did so much in it. Douglas then gave another short speech thanking everyone for attending Liz’s funeral and wake and saying how amazingly impressed Liz would have been with so many friends attending. 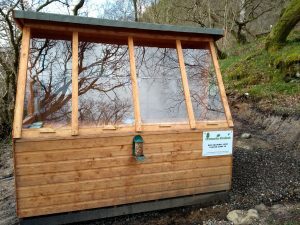 Donations for Liz’s ‘Contemplation Shelter’ in Cormonachan Woodlands amounted to £669 in cash at the funeral and wake with £2796 being sent in prior to the funeral and the day after. A total to date of £3,465. Thank you to everyone for these generous donations towards Liz’s special shelter. Many of her friends said they would be making bank transfers after the funeral and two other future donors, including Forestry Commission Scotland said they will be giving large donations once they knew how much more money will be required to build a lasting memorial in the community woodlands. As our Treasurer is now away on holiday until the end of February, I will not be able to acknowledge further donations until then. 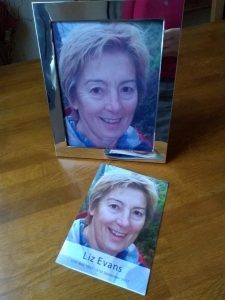 My own Tribute to Liz that I read out at the funeral can be read on my own Facebook page for Douglas Locke.